There are very tempting reasons to try it but using a television as your computer's main display comes with issues. AppleInsider tells you what you have to consider and examines whether the low cost is worth the trade-offs. We tidied the living room for you. Everyone has done exactly this. We've spent an extremely long day in front of a monitor and we have gone home only to spend an hour or two more in front of a TV set. And while we're a bit more likely to watch the NFL on that screen than we are an Excel spreadsheet, these two different types of displays have become steadily more and more similar. Both are now very nearly always flat-panel displays. They might have a curve to them, but the days of the giant cathode ray tube sticking out the back are gone. True, a TV set is typically larger than a computer monitor, but then we watch it from further away. TV sets don't often come with FaceTime cameras built in but then nor do most monitors, unless they're the one that an iMac is wrapped around. Plus while it used to be that you physically couldn't connect your Mac to your TV, you've been able to for a long time. There are plenty of older Mac minis that are plugged into televisions. Then, while there's still a difference between watching a movie in your living room and watching a computer display, half of today's movies are computer graphics anyway. What's more, you're already used to playing video games on your TV set and gaming is one of the best tests for any monitor. All of this would be interesting academically but there's one more facet that makes the similarity of TVs and monitors significant —money. It is usually vastly cheaper to buy a television than a monitor for equivalent size. Right now you can easily get, say, a 32-inch TV set for well less than $400 whereas a 32-inch monitor will cost you $600. That's not an enormous difference but you wouldn't casually pay $200 more than you needed. Yet, that's a price for only a reasonably standard monitor and if you need more, you pay much more. Take Dell's new UltraSharp 49-inch monitor. It is ludicrously wide, completely impractical for the giant majority of Mac users, but you definitely want one. That would currently cost you around $1,600 at Amazon. 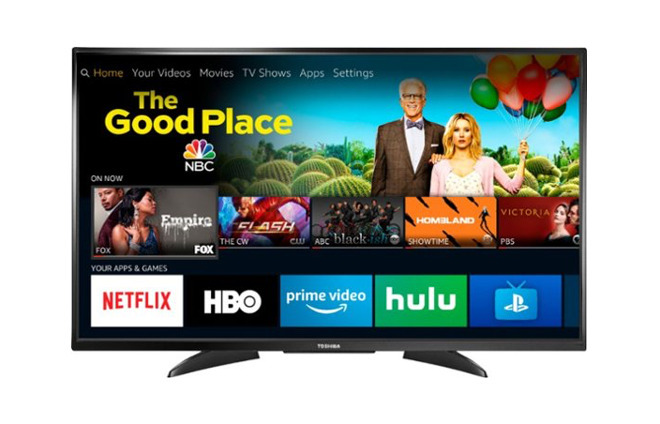 Whereas just $400 gets you Toshiba's 50LF621U19 50-inch 4K Ultra HD Smart LED TV HDR - Fire TV Edition. Monitor and TV prices are peculiar. Even when you buy through Amazon, instead of one seller you may get a range of dozens and the prices will all be different plus the prices will change. When you're trying to compare different models, especially if you're overseas, then it's bewildering trying to be sure you're looking at the right monitor. And then you can see a list of TVs or monitors where some are being sold new and some used, some are definitely straight from the manufacturer and other are from places you've never heard of. Take enough time to price compare, then, and you could spend less on that monitor or more on the TV set. It's just that this kind of range is far from unusual and that price difference of $1,200 is far from easy to ignore. It's not that display manufacturers think they can get more money out of us by calling something a monitor. There may well be an element of that but there are also significant differences between these types of screens. Some may not concern you at all and some could be deal-breakers, but you need to know what they are. Every one of them, though, comes down to the fact that a TV is designed to be watched from a distance and a monitor is expected to be used close-up. The first and in one way clearest ramification of this is the resolution of the screen, versus the size. If you got a 50-inch TV set then since screens are described with the diagonal size, the actual height of its display would be about 23.5 inches while the width will be 43 inches. At 4K resolution, that means 89 pixels per inch horizontally and 92 pixels per inch vertically. The original Mac was 72 pixels per inch. Compare that to the Dell 49-inch monitor which has a resolution of 5,120 x 1,440 pixels. With that monitor's different shape, it works out to 109 pixels per inch or about 18 percent better. Then compare that to the current iMac's 5,120 x 2,880 resolution in a 27-inch display which gets you 218 pixels per inch. There is no TV set that will match the quality of the 5K display in an iMac, for instance. 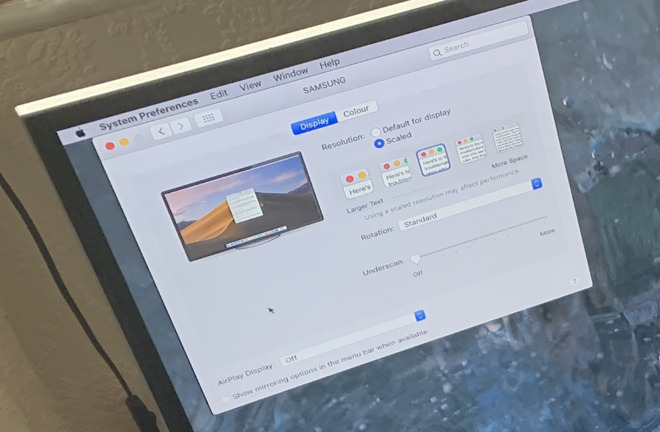 So if you're moving from an iMac, you have to expect that a TV will show you icons and menus that are bigger than you're used to and less sharp than you want. Nothing can change that, but it is a trade-off as you do get some benefits alongside the losses. Chiefly, you get screen real estate as you can afford to buy a bigger TV than you ever can afford a bigger monitor. The ability to have more windows open on screen at once and the ability to see more of your work without shuffling documents around is the reason to go for a larger display. Plus, you will get used to it. You might have buyer's remorse for a few days but after that, you will typically forget the clarity of what Apple calls a Retina display and instead appreciate the greater room you have to work in. There are limits, though. Save yourself certain disappointment by definitely avoiding anything below a 4K television set. Just to be consistently confusing in every way possible, some manufacturers will call their sets 4K while others say Ultra HD. Still more with label them UHD. And just occasionally, a manufacturer will use all of these terms together. They can because they all mean the same thing. They mean a screen resolution of 3,840 x 2,160 pixels and they will state that figure somewhere in the technical description. Accept no less. Next, check that the set has a HDMI port - and that so does your Mac. You're unlikely to find a TV that doesn't have one but you are likely to need an adaptor for your Mac. The 2018 Mac mini and the current Mac Pro come with HDMI ports. The MacBook and MacBook pro will need a USB-C to HDMI cable. That seems straightforward. But, for some people this is going to be a bigger issue than the resolution of the screen. You can get used to a lower resolution but you can't add ports you haven't got. So where you may previously have had a monitor that lets you connect via Thunderbolt 3 or you have USB-C connectors that mean the monitor can charge up your MacBook, that's over when you switch to a TV set. If your laptop is a current MacBook Pro or MacBook Air then this isn't a problem because you have two USB-C ports on your computer. You can use one to charge the laptop and the other, with an adaptor, to connect to the TV over HDMI. If you have a MacBook, you've only got the one port, so to charge and work the monitor at the same time you're going to need a dock. Buying any equipment means thinking about what you're going to use it for, and weighing up the cost against the benefits. In this case, though, there is more specific detail that you have to think about. Whereas with a regular monitor you might just consider the size and the price, when you're thinking of a TV set, you hit two more important details. These are the frame refresh rate and the input lag. No matter what you use your computer for, you are going to be affected by both of these. It's just that you may have little need to care and you may well be fine with simply getting used to the difference. The refresh rate is how often the display redraws the whole image you see on screen. Input lag is the time it takes from, say, you pressing a key on your keyboard, to the screen showing what you've pressed. A typical monitor has a refresh rate of 60Hz and so does a typical TV set. If this were the only issue, you would not notice any difference between the two types of screen in regular use but it isn't. And very many of us have more demanding requirements than regular use, such as video editing or, especially, gaming. A monitor designed for gaming will refresh at a rate of at least 75Hz but may even go as high as 240Hz. You will get TV sets that claim higher than 60Hz rates and sometimes they'll even advertise that they run at 480Hz. That's never a true refresh rate, though. Instead, it's an equivalent produced by software that creates fake frames. That can smooth out certain images when you're watching TV but it's worthless for games. It's not as if it's great for watching movies, either. Actor Tom Cruise and director Christopher McQuarrie even shot a video about how new TV sets even default to a picture mode that does this smoothing or video interpolation to the detriment of movies. Then, too, there are few TV sets that support AMD's FreeSync or Nvidia's G-Sync. These work to improve how games look on your display and specifically to remove the kind of tearing look you can get when a game's frame rate isn't quite the same as your screen's. If you're not a gamer then you'd imagine that none of this is of any importance to you but it's really that games shine a spotlight on issues that affect us all. And, it's the same with the input lag —you can expect that the lag between pressing a key and seeing the result on a monitor will be around 4ms but with a typical TV set, it could easily be ten times slower at 40ms or more. Typists will notice that difference but may be able to adjust. Gamers will certainly notice it, and adjusting will be a pain —if they want to at all. Unless they're planning to cut down on the amount of time they spend playing, in which case regularly getting blasted by the bad guy before they can react could do it. That said, TV sets often have a feature that monitors do not and that's a gaming mode. You may have to fiddle with your TV's settings but there can be a picture mode that is specifically designed to help with these issues. It's a fudge, though. In order to display screen elements faster, the TV slightly degrades the picture quality. On the positive side, though, TV sets can come with better speakers than monitors because they're designed to show you movies that you listen to across your living room. That flat screen monitor doesn't really have enough space for room-filling speakers, but if you're sitting four feet away, that matters less than it did in the larger space. There is one more issue that definitely affects using a TV set and often affects regular monitors. It's your Mac. While your Mac can drive a 4K display, it isn't always fast at doing it. The GPUs in Macs are fine but at least in the Mac mini, they're anemic enough that a little industry of external GPUs have grown up around them. Unless you also buy an eGPU, then, you may find that your Mac feels a little sluggish when you're using it plugged into a large TV set. Fortunately, there's a way to check this out. These days, fewer and fewer places stock a significant range of large monitors that you can study in action. Many more places have large TV sets on display but none of those will be showing you the desktop of a Mac. So you're reduced to picking as carefully as you can, ordering online and then returning the screen if it isn't right. You may yet have to do that here, but if you happen to have a Mac mini or a Mac Pro, you've surely also got a TV set. So take that Mac down to your living room and plug it in. If you've got an Apple TV too, then you've even already got the HDMI cable you need. Doing this with your living room set might annoy other members of your household but it will show you clearer than anything whether a TV set is going to be right for you as a monitor. Just remember to sit as close to the screen as you would if it were on your desk. And use the Mac on it for a while. You know now that you're likely to find the resolution noticeably lower than you're used to and you may see the sluggishness of the Mac. What you could also find is that the colors look a little off because of chroma differences. You can experiment with the settings from the Mac to adjust this color issue as well as resolution and refresh rate, but all within very limited parameters. Open System Preferences, and click on Display. 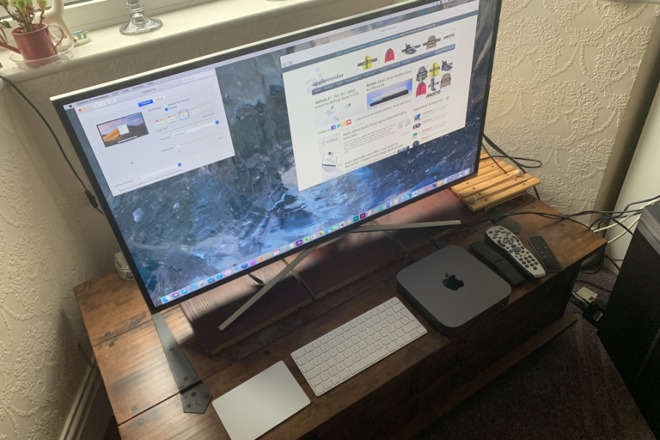 What you see varies slightly depending on the type of display connected and the Mac will have already had a good go at selecting the optimum settings for you. Despite every difference and every issue we've mentioned, the fact is that TV sets today are a lot closer to computer monitors than they have ever been. You can definitely use a television on your Mac and you may well find that the issues which are deal-breakers for some people simply don't affect you. If you're a video content creator, you should probably get a television as your second monitor anyway, to see how your content looks on that viewing vector. That said, a TV is not as good as a monitor on your Mac. If you're looking for something around the 32-inch mark, then we'd say you should go for the monitor —even if it means waiting another paycheck or two to save up the difference.